Cara Luft continues to be one of the most innovative artists on the Canadian music roots scene. Since first making a mark some years ago as a member of the Wailin Jennys, she has carved out a successful solo career alongside some crafted collaborations. 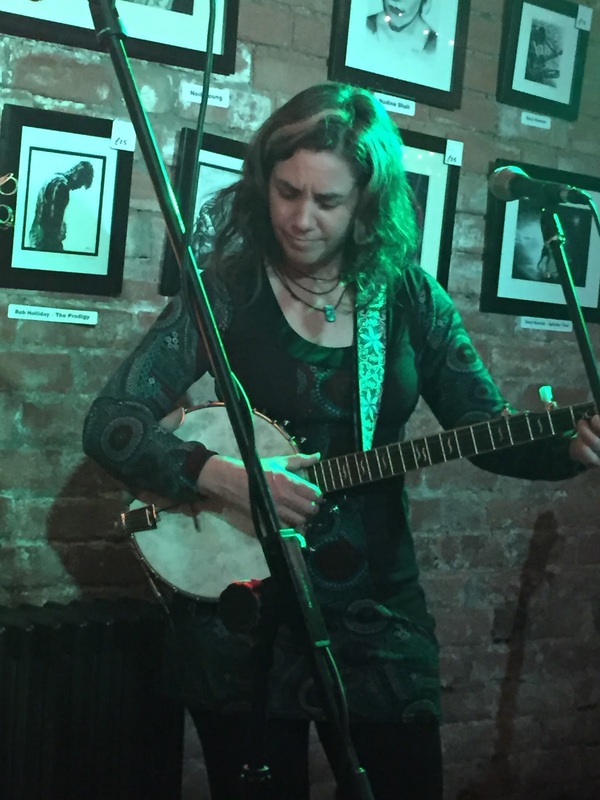 Among several visits to the city of Birmingham over the years, Cara appeared with Brandy Zdan and Awna Teixeira in the momentarily branded ABC of Canadian Music. 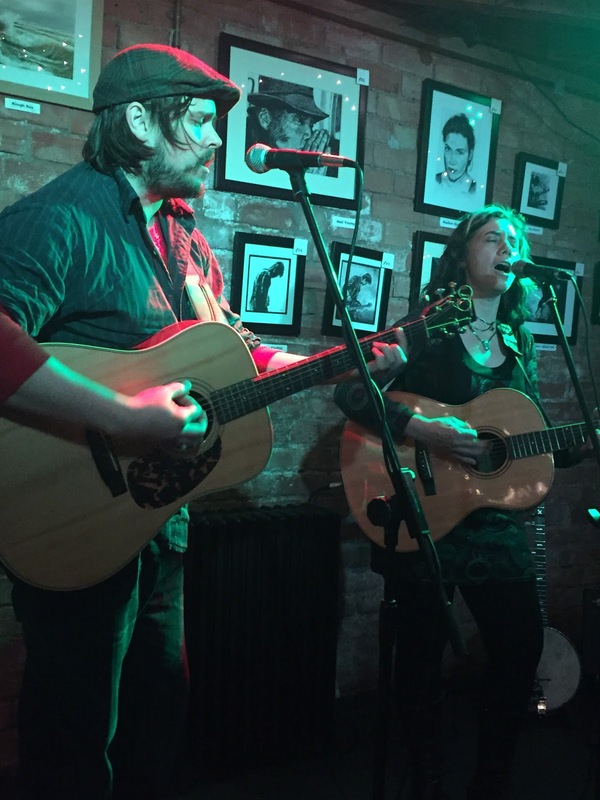 Just under eighteen months ago, she introduced a new musical partner in JD Edwards during a Kitchen Garden Café visit and now the partnership has been anointed in the guise of a recording and performing duo billed as The Small Glories. In the slipstream of a Celtic Connections appointment, Cara and JD slotted in another Birmingham visit with many old friends heading to the Kitchen to give them the usual warm welcome. Although this piece commenced with a Cara Luft focus, The Small Glories is now a fully preserved and balanced duo with this perception formed after being present on the both occasions JD has graced the venue. Of course old habits remain and when they consist of Cara’s exquisite banjo playing then they are always welcome. Vocally the duo has almost perfected the shared basis which is also reflected in the stage banter with JD far more forthcoming with background stories and humour. Musically JD flits between standard acoustic guitar and harmonica. While the rocking days of the JD Edwards Band have been put on temporarily hold, there is still a raw edge to his vocals which you could feel at any time blossoming among a barrage of electric amplification. However this evening they work exceedingly well in an intimate acoustic setting. Across the two sets allotted to them, The Small Glories gave a decent representation of the past, present and future. Of course the past pre-dated the pair’s union, but JD easily slipped into support mode to help Cara deliver ‘No Friend of Mine’ and ‘Bring ‘Em All In’ from two of her previous records. The duo also collaborated expertly on the traditional tune ‘Black Water Side’, another from Cara’s THE LIGHT FANTASTIC album and an individual take on the Bert Jansch/Jimmy Page inspired version. Two other covers that were introduced as The Small Glories interpretations were Woody Guthrie’s ‘Way Over Yonder in the Minor Key’ and Dirk Powell’s ‘Water Bound’. 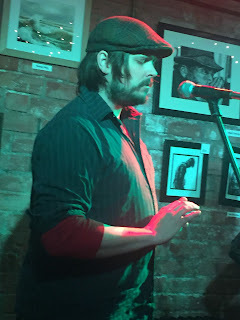 The latter had the usual unplugged/off mic treatment to end a Kitchen Garden Café show, while prior to the former, JD reminisced about his own grandfather’s life in Oklahoma. Winnipeg Manitoba has been the home to the last couple of generations of JD’s family and he is now fully entrenched as an established Canadian songwriter mixing with other artists the breadth of this vast nation including those in the far eastern Maritime Provinces. Bringing things right up to the present and some of the new recordings have been made available on a short EP ahead of a debut full length album release expected to be available in April. 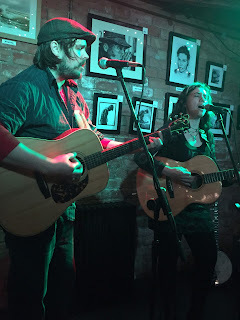 From this EP, which can be downloaded from the duo’s website subject to a generous donation, the songs ‘Long, Long Moon’, ‘True Story’ and ‘Oh My Love’ were all shared with the audience this evening. Of the songs previewed from the upcoming album (we were reliably informed that none are duplicated from the EP), ‘Ol’ Garage’, with its deeper than the obvious sentiments, was the most memorable with 'Had I Paid' not far behind. One other notable song from the evening was the one Cara co-wrote with Bella Hardy for Bella’s most recent album. ‘Time Wanders By’ is a fabulous song and a personal favourite from WITH THE DAWN, painting the perfect picture of being in awe of the Rockies. The appreciation and love that Cara has from UK audiences is a credit to the effort she has put in, assisted by a charming personality and the skilful ways in which she shares her music and song. This project with JD is set to continue the process in the foreseeable future and while we adjust to the name The Small Glories, there is no guilt in just referring to it as the work of Cara Luft and JD Edwards.